These three Government Land Office survey maps are for Township 11 South, Range 23 East, for portions of Wyandotte and Johnson Counties, Kansas. The first image, dated 1861 and signed by Mark Delahay as Surveyor General. 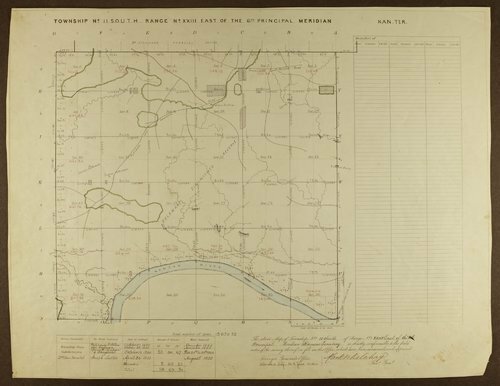 It provides detail for all of the sections (except those south of the Kansas River) for the entire range and township including the Delaware Diminshed Reserve, the Kansas River, and various roads in the area. The second image is dated 1857 with J. Calhoun as the Surveyor General. It shows detail for only sections 32 through 36, including the Kansas River. The third image is dated 1868 and shows detail for Section 32 only. Apparently, only the portions of sections south of the Kansas River are in Johnson County.